Ok so I wasn’t very good about taking pictures this week. You are only getting one. It was however, the best meal of the week so I am glad that I at least remembered for that one. 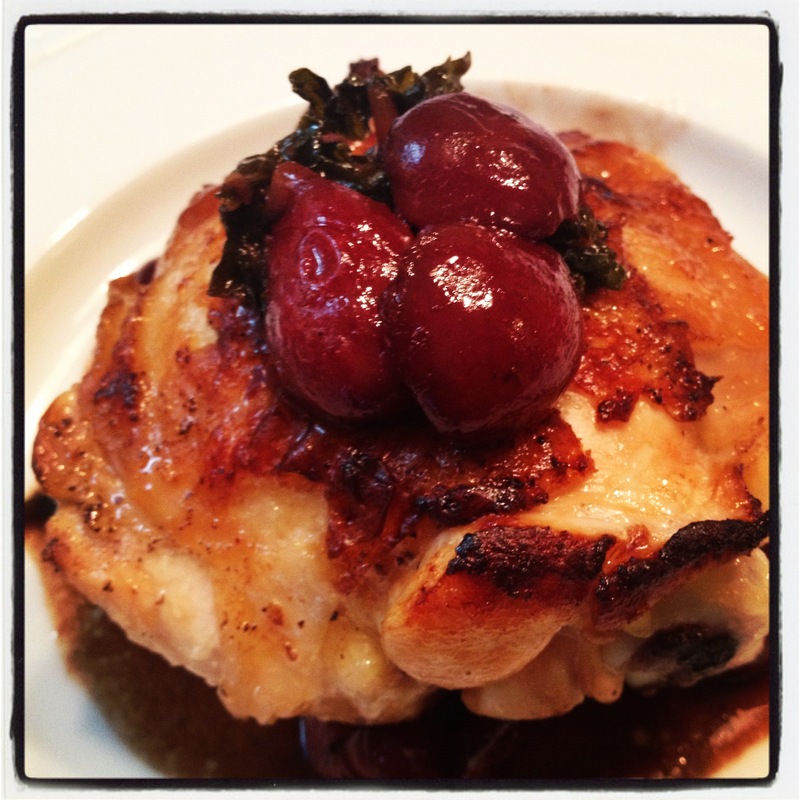 The roasted chicken with cherries and kale was definitely a different meal for us. I love kale, and combined with the cherries and balsamic, I probably would have eaten this all week. Greg was a little hesitant with the cherries, but even he commented on how much he liked it and thought for sure the cherries would have been too sweet. The chicken thighs were also a must for this recipe. The original recipe called for boneless, skinless chicken breasts, and I can tell you right now they would have been way to dry. These stayed juicy and you can easily take the skin off if you are trying to be health conscious. The lamb kofta kebabs are inspired by our trip to Greece. Greg got this amazing platter with lamb patties, pita bread, tzatziki, and rice. It was a little over the top, but SO delicious. I paired it down a little bit, but you could easily pick up some tzatziki from the grocery store (near the hummus) or make your own. All you need is about a cup of greek yogurt, 1/2 cup shredded cucumber squeezed dry with a paper towel, a clove of garlic minced, a touch of lemon juice, and some dill and mint to taste. This is definitely something that people either like to have a strong flavor, or a more mild flavor, so adjust the seasonings according to your taste. You really can’t screw it up though. The Soy-Sesame Grilled Mahi Mahi is an easy go-to summer meal. It is so easy to throw the marinade together and let it do it’s thing while you are at work, running errands, etc. Then it is just a matter of throwing it on the grill and serving it up! You could always double the rice pilaf recipe from Tuesday and serve it with that as well. Happy August and Have a great weekend!